Chartham is a village and civil parish on the Great Stour river in the vale of the Kent Downs, 4 miles (6 km) west of Canterbury, England. The Great Stour Way path passes through the village. A paper mill in the village has specialised in the production of tracing paper since 1938. There are numerous arable farms and orchards in the parish. The village has an unmanned station, Chartham, and a manned level crossing. It has an outlying locality sharing in many of the community resources, Chartham Hatch. The earliest recorded form of the name is Certham. The name Chartham literally means 'Village on rough ground', and the word "Chart" is also found in other villages in Kent with this meaning. The river provided power for the paper mills until some point before 1955. Paper making has been a major occupation for the last 625 years; the mill dates from the late eighteenth century. The dovecote at Burnt House Farm is not only notable for its building's architectural merit but is also a Scheduled Ancient Monument for its importance in sending homing birds to and from important envoys such as the Archbishop of Canterbury. Chartham is located on the Great Stour river and vale of the Kent Downs Area of Outstanding Natural Beauty. Its paper mill specialises in the production of tracing paper. There are numerous arable farms and orchards in the parish. The village is served by Chartham railway station and the Great Stour Way path. 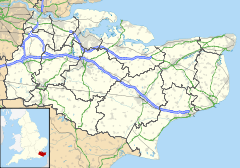 At the national level Chartham is in the parliamentary constituency of Canterbury for which Rosie Duffield (Labour) has been MP since 2017. For European elections Chartham is in the South East England constituency. Chartham is also part of the electoral ward called Chartham and Stone Street. The population of this ward at the 2011 Census was 5,878. In the census of 1801 the number of people present in the parish of Chartham, enclosing an area of about 3 square miles (8 km2) and including the settlement of Chartham Hatch, was given as 776, and this figure remained roughly stable until the late 19th century when a dramatic increase was recorded: in the census of 1881, the number was given as 2,473. The Church of St Mary is located next to the village green and contains six bells, five of which were made by Joseph Hatch in 1605, which makes them the oldest complete set by the same bellfounder in Kent. It was built in approximately 1294 and features a number of brasses, including that of Sir Robert de Setvans (d 1306). The stonework of its chancel windows exhibit a form of tracery, known as Kentish or split cusp tracery, which originates here. The tower is 14th century and the renovation was in 1875 by Oxford University architect George Edmund Street. The Chartham railway station lies one stop west of Canterbury West and has regular trains to London stations including London Victoria station and London Charing Cross railway station. The HS1 trains also pass through the station but do not stop here. The village is contiguous with the smaller Shalmsford Street to the west, and was until recently the location of St Augustine's Mental Hospital, formerly known as the East Kent Lunatic Asylum. The site on which St Augustine's stood has now become a housing estate. The village’s Post Office used to lie on 105 Shalmsford Street but is now located at 14B Godfrey Gardens in the Chartham Downs housing area. In Shalmsford Street is also Chartham Primary School, in which Chartham Parish meetings are held. Chartham Hatch is the northern upper part of the village, also known as a hamlet, of around 200 houses. It is surrounded by small woods and its orchards of apples and pears. Village Hall, formerly the school, is in the centre. The famous North Downs Way passes through the village. Horton or Horton Manor is a tiny hamlet northeast by the Great Stour Way with its weir, Grade II listed manor house, and scheduled ancient monument manor chapel remains, later which became an oast house and agricultural storage area. In 844 King Æthelwulf of Wessex granted land at Horton to Ealdorman Eadred. A translation of the text of Charter S 319 reads: "Bounds of Horton. On the east: the wood which is called down-grove. On the west: the [arch]bishop and Lulla jointly. On the southern side: the land of Lulla at Chartham. On the north: the land of Beornwulf, which he possesses in eternity." These hamlets are south west along the Great Stour and to the south east. Mystole is rich in heritage due to its focal point, Mystole House, a 16th-century historic building, with architectural Grade II* status and former appurtenances/outbuildings: Grade II* listed Mystole Coach House; its Park; listed orangery; tennis court; Archway Lodge; The Tetherings and Stable House. Thruxted itself has a large working farmhouse. ^ "Paper Manufacturer; Arjowiggins Creative Papers Suppliers of Translucent Paper". arjowiggins-tracingpapers.com. Retrieved 24 August 2012. ^ Historic England. "Details from listed building database (1018874)". National Heritage List for England. Retrieved 23 May 2012. ^ "Details of path, paper mills trail and local landmarks". Canterbury City Council. Archived from the original on 29 July 2012. Retrieved 23 May 2012. ^ "Key Figures for 2011 Census: Key Statistics – Area: Chartham and Stone Street (Ward)". Neighbourhood Statistics. Office for National Statistics. Retrieved 20 January 2017. ^ Vision of Britain (2009). "Chartham AP/CP". University of Portsmouth et al. chart view. Retrieved 12 June 2014. ^ "Oldest 100 Ringing Bells in Kent". kent.lovesguide.com. 2010. Archived from the original on 6 June 2011. Retrieved 24 August 2012. ^ Stephen Hart (18 March 2010). Medieval Church Window Tracery in England. Boydell & Brewer Ltd. p. 68. Retrieved 24 August 2012. ^ Historic England. "Details from listed building database (1100352)". National Heritage List for England. Retrieved 23 May 2012. ^ "Branch Finder". The Post Office. Retrieved 23 May 2012. ^ Historic England. "Details from listed building database (1255391)". National Heritage List for England. Retrieved 23 May 2012. ^ Historic England. "Details from listed building database (1085714)". National Heritage List for England. Retrieved 23 May 2012. ^ Historic England. "Details from listed building database (1085682)". National Heritage List for England. Retrieved 23 May 2012. ^ Historic England. "Details from listed building database (1100332)". National Heritage List for England. Retrieved 23 May 2012. ^ Historic England. "Details from listed building database (1085684)". National Heritage List for England. Retrieved 23 May 2012. ^ Historic England. "Details from listed building database (1348494)". National Heritage List for England. Retrieved 23 May 2012. ^ Historic England. "Details from listed building database (1336502)". National Heritage List for England. Retrieved 23 May 2012. ^ Historic England. "Details from listed building database (1085685)". National Heritage List for England. Retrieved 23 May 2012. This page was last edited on 26 April 2019, at 04:33 (UTC).